The Model 6000 Phase Meter automatically selects the proper range for both amplitude and phase and is waveshape independent. The user only needs to connect the two input cables to the phase meter to obtain a phase reading. Overrange and Underrange LED''s indicate whether either of the two input signals is too large or too small. An OFFSET toggle on the front panel allows the user to make differential phase measurements without the need of subtracting large numbers. No front panel screwdriver adjustments for any function of the phase meter are required. 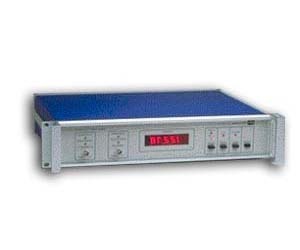 The Model 6000 Phase Meter has an optically isolated IEEE-488 1978 interface as a standard feature. Via the Bus interface the user can read the display, toggle the phase range, and check for input signal overrange or underrange, front panel selected offset and phase range. The optical isolation prevents ground loops (and the resulting phase errors) between the input signals and the digital bus controller circuits. The Model 6000 Phase Meter has two phase ranges: The 0° to 360° range and the ±180° range. Range switching occurs either automatically when the display indication approaches within 10° of the range limit or manually when the front panel RANGE toggle switch is pressed. In the regions where the ranges overlap, differences of less than ±10m° result when switching occurs. Unique circuitry, including filter banks which switch in automatically as the input frequency is decreased and unipolar hysteresis around the comparators, enables the Model 6000 Phase Meter to operate to low frequencies with input signals which have been corrupted by noise or other disturbances without erratic operation. Keyboard control allows removal of the filters for optimum square wave measurements. Display indicates whether filters are "in" or "out" of the circuit. The Model 6000 Phase Meter operates with input frequencies between 5Hz and 500kHz. For frequencies between 10Hz and 50kHz typical accuracies are ±20m° regardless of amplitude ratios which may exceed 10000:1. The high accuracy of the Model 6000 Phase Meter is maintained not only for sinewaves but also for square waves and triangular waves. Unique internal circuitry produces waveform independent phase readings; hence, the user does not have to activate any front panel waveform selection switches. Two different waveforms of the same frequency may be applied to the Phase Meter simultaneously. The inclusion of the IEEE Bus allows both the USE and the CALIBRATION checking of the Model 6000 to be easily automated. Typical accuracy of ±20m° and low drift are obtained by complete circuit integration under microprocessor control. Potential drifts due to voltage variations are eliminated by differential dual slope analog to digital converters. Effects of analog offsets are eliminated with the use of dual comparators in each channel. Accuracies of ±50m° (typically ±20m°) are maintained not only with equal amplitude signals in both channels but also with amplitude ratios in excess of 1000:1 (60db) between the signals. Unique input protection circuitry allows for the sudden application of high input voltages without fear of damage to the Model 6000 Phase Meter. There is no need to slowly increase the levels of input voltages. Neither input of the Model 6000 Phase Meter is connected to chassis ground; hence measurements may be made on networks with "earth ground" connections without creating ground loops with their resultant phase errors. The Model 6000 Phase Meter settles to within its specified accuracy typically within 5 seconds following an abrupt change in input conditions. The Model 6000 Phase Meter has been designed to reduce phase errors caused by the presence of even harmonic distortion present in one input channel and not the other. For example, a 1% second harmonic distortion component in one channel produces a phase error of less than 5m° which is less than the minimum phase resolution of the Phase Meter.